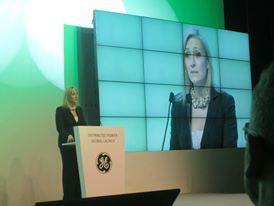 General Electric launched its global distributed power business on 25 February at Hotel Indonesia Kempinski Ballroom. The event was officiated by GE Vice Chairman John Rice and GE's President and CEO for Distributed Power Lorraine Bolsinger. The event witnessed hundreds of participants from the global energy industry including suppliers, power producers, and clients. Also gracing the event was Vice Minister Susilo Siswoutomo who emphasized the importance of GE’s new business in upgrading the power capabilities in Indonesia and its rural areas.